It's a C100 with 4K. A dream come true!!! Will pale in comparison to all similarly-priced competitors, but sell more than all of them combined. I see CFAST slots there on the side. PS - reminds me of Canon Scoopic - amazing 16mm camera from back in the day. As a Canon non-fanboy, I am impressed. It looks great for the independent filmmaker, especially for those working in doc or narrative. The C200’s lightweight body of just 1.4kg is designed for comfortable hand-held shooting. Offering exceptional creativity, the compact size makes the C200 suitable for mounting onto a drone or gimbal. Combine Dual Pixel CMOS AF with the LCD Monitor LM-V1, with touch panel support, focusing becomes even * more intuitive, with the capability to choose the subject for focusing with a touch. 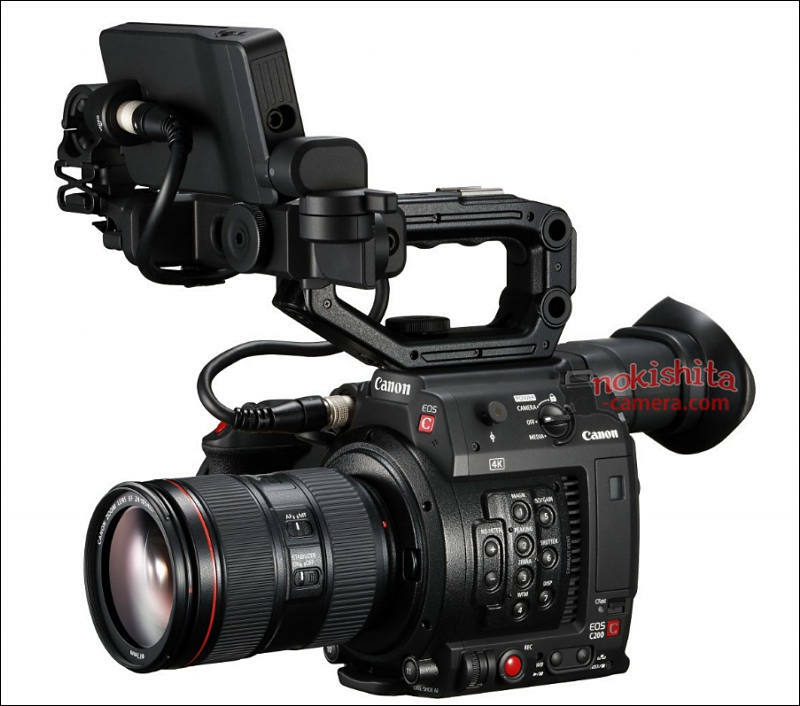 The C200 offers high-speed One-Push AF and continuous AF within a horizontal and vertical range of the screen of approx. 80%. 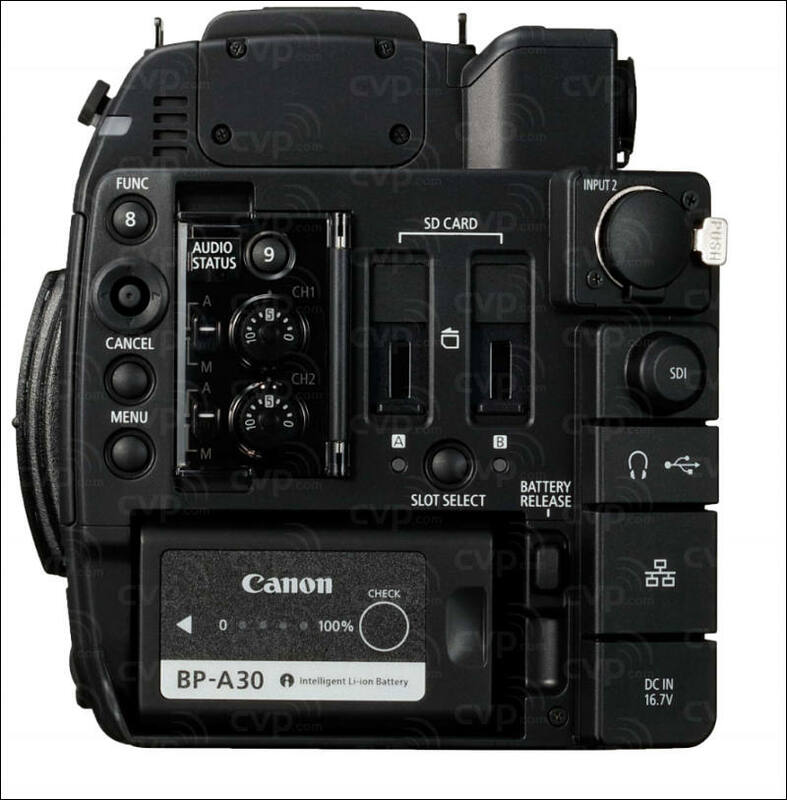 The C200 supports a variety of output signals via HD-SDI and HDMI. High quality on-board audio is delivered via 2 x XLR terminals. An EVF LUT with partial HDR simulation enables a view close to an HDR display. HDR View Assist (400%/1600%) checking is also possible on the LM-V1. Representing the third generation of the Cinema EOS system, the Canon EOS C200 and Canon EOS C200B Digital Cinema Cameras feature the latest in Canon technologies and offer two 4K video formats, Canon’s new Cinema RAW Light and MP4, optimized for those interested in recording beautiful HDR video. 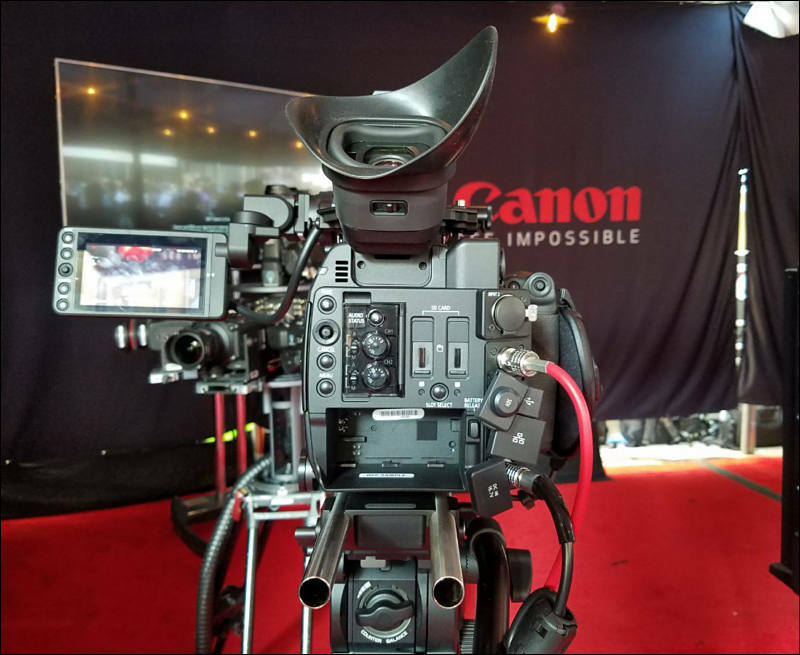 Alongside a newly developed dual DIGIC DV6 image processing system, Canon’s celebrated Dual Pixel CMOS AF system and improved operability for professionals, these new products C200B are capable of capturing stunning 4K video across a variety of production applications. The Canon EOS C200 and Canon EOS C200B Digital Cinema Cameras sport the same 8.85MP CMOS sensor, that combines with a newly developed dual DIGIC DV6 image processing system to help process high-resolution image data and record video from Full HD (1920x1080) and 2K (2048x1080) to 4K UHD (3840x2160) and 4K DCI (4096x2160). A core staple of the third generation Cinema EOS System, this new processing platform offers wide-ranging expressive capabilities and improved operation when capturing high-quality HDR video. 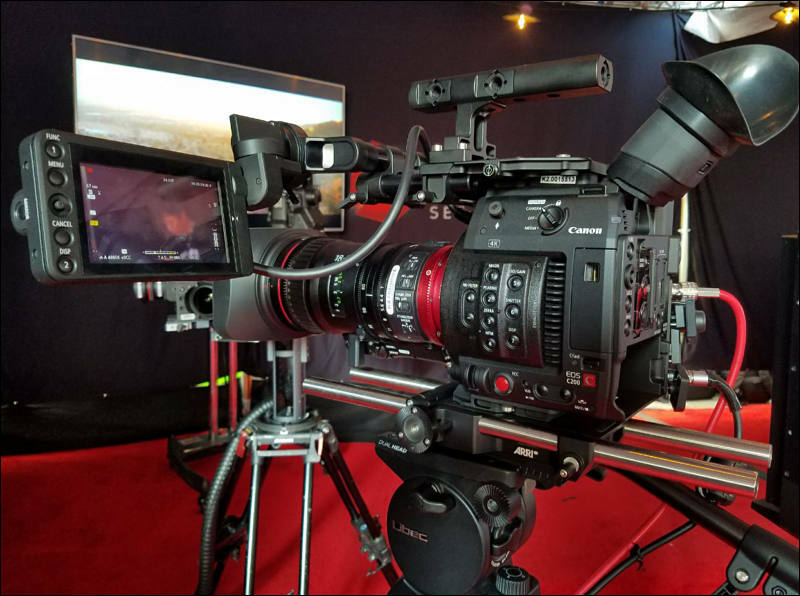 The Canon EOS C200 and Canon EOS C200B Digital Cinema Cameras feature Innovative Focus Control that helps assist with 4K shooting that demands precise focusing, whether from single or remote operation. Canon’s acclaimed Dual Pixel CMOS AF technology helps to expand the distance of the subject area to enable faster focus during 4K video recording. This also allows for highly accurate continuous AF and face detection AF when using EF lenses. For 4K video opportunities that call for precise focus accuracy that can’t be checked on an HD monitor, users can also take advantage of the LCD Monitor LM-V1 (supplied with the EOS C200 camera), which provides intuitive touch focusing support to help filmmakers achieve sophisticated focusing even as a single operator. Editing and grading of Cinema RAW Light video format will be supported in DaVinci Resolve of Blackmagic Design. Editing will also be possible in Media Composer® from Avid Technology®, using Canon RAW Plugin for Avid Media Access®1 This format can also be processed using a Canon application, Cinema RAW Development. Demonstrations using these software programs will be given at the 2017 Cine Gear Expo June 1st-4th in Hollywood, CA. Furthermore, Premiere Pro CC of Adobe® Systems will support this format until the end of a 2017. Editing will also be possible in Final Cut Pro® X from Apple®, using Canon RAW Plugin for Final Cut Pro X®. *3 after second half of this year. The Canon EOS C200 and EOS C200B Digital Cinema Cameras are scheduled to be available in August 2017 for estimated retail prices of $7,499 and $5,999 respectively. The EOS C200 comes equipped with additional accessories including the LM-V1 LCD Monitor, LA-V1 LCD Attachment, GR-V1 Camera Grip and HDU-2 Handle Unit. These accessories will also be sold separately and available in September 2017. An ideal complement for the EOS C200 Cinema Camera is the recently announced COMPACT-SERVO 70-200mm Zoom Lens. The lens is scheduled to be available later in 2017, for an estimated retail price of $5800.MELVILLE, N.Y., May 31, 2017 – Canon U.S.A., Inc., a leader in digital imaging solutions, today announced the Canon EOS C200 and Canon EOS C200B Digital Cinema Cameras, the latest additions to its acclaimed Cinema EOS line of professional cinema cameras. Designed to meet the demanding needs of filmmakers and TV production users, the new Canon cinema offerings will combine the ease of use of entry level cinema cameras with exciting new, high-end features that are ideal for cinema, documentary, wildlife, wedding and events productions. The new COMPACT-SERVO 70-200mm Zoom Lens looks interesting. However at T4.4 I think the price factor may be a bit high: $5800 USD. Canon RAW Light can be not entirely raw. So it can have applied channel gains (for WB) and ISO. As far as I understand Canon guys from our interview it is 12bit compressed thing, out of 14-16bit ADC original signal. CFast = SATA interface. Use something like this to attach storage and power SSD with USB power brick or DTAP. I know. But it looks nasty and not suitable for many occasions. CFast has always been expensive. Possibly because it's not a mainstream product? SD cards are much better form factor, (not too small- not too large) and are used in basically all small cameras, apart from really small cameras that use microSD. If however the landscape changes and all these small point & shoot cameras disappear then possibly SD card cost will rise? We already see that UHSii is very expensive, question is will these also come down in price? If the consumer cameras disappear then a very different situation will happen. Aside from PCB and plastic case it is zero investments, as they use same controllers and NAND chips as mass products. So it is greed only. Very similar here. Companies reach cartel agreement usually to milk users and get big profits for owners.